By now you’ve discovered the exciting range of products offered through Cougar Beauty! However, you might be wondering how to utilize your new collection. There’s no need to worry. We present to you our basic Cougar Beauty routine. This guide, suitable for all skin types, covers mornings, nights, weekly maintenance and everything in-between! Every morning should start fresh, and every evening should leave you feeling relaxed! Our beauty experts recommend starting off your morning or evening routine with a high-quality cleanser. Start your ritual with Cougar Beauty Snake Venom daily cleansing cream. This cleanser, which contains proprietary synthetic snake venom, gently exfoliates skin, removing dirt and other impurities, providing a clean palette upon which to build your look for the day! Wipe face clean with a damp cloth. Apply Cougar Beauty Snake Venom daily cleansing cream. You only need to lightly coat your skin as you massage the product over your face! Rinse clean with water, and pat dry with a fresh cloth. Alternately, try Cougar Beauty Wild Caviar daily cleansing cream! After your cleanse, your next step is to apply your preferred facial oil or serum. We suggest the Cougar Beauty Hyaluronic Acid Facial Oil. We loved this product enough to make it our TLV! Why would you want to use a facial oil containing hyaluronic acid? Hyaluronic acid is produced by your body, naturally. However, as we age, the supply begins to diminish. By introducing this step, we aid our body’s struggle against aging. After cleansing, massage 2-3 drops of facial oil onto your face and neck. It helps moisturize the face and neck, leaving skin feeling fresher and firmer. After a month, witness incredible results! To finish off your morning routine, you’ll want to apply a suitable cream. With Cougar Beauty, our suggested option is the Cougar Beauty Snake Venom Day Moisturizer. Moisturizing creams are one of the most important steps to any daily regimen. Cougar Beauty moisturizing creams are loaded with antioxidants. Antioxidants are useful to your skin, as they help protect it from free radicals. These are all of the harmful, everyday elements that attack our bodies. Also, containing Cougar Beauty’s proprietary Snake Venom, this cream also helps tighten and firm the skin when applied. Bear in mind that a night formulation of this useful moisturizing cream is also available. When performing the above steps at night, substitute the Cougar Beauty Snake Venom Night Moisturizer. This specially formulated blend contains more of the good stuff that helps moisturize your skin overnight. Just apply normally and let it deeply penetrate your body. It works while you sleep! For a change try Cougar Beauty Wild Caviar day and night cream! Facial masks are an important step to any beauty regimen. They aid in moisturizing skin and keeping it clean, minimizing blemishes over time. 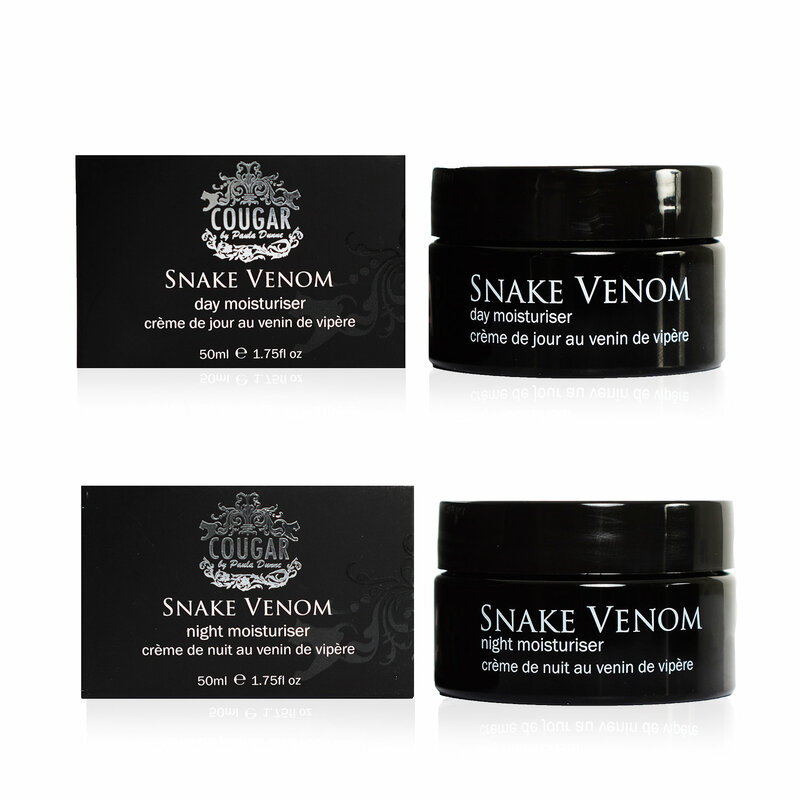 Our recommendation is the Cougar Beauty Snake Venom Purifying Face Mask. Blanket your face with the product, allowing the active ingredients to go to work. The mask will help draw impurities from your skin while the synthetic snake venom component aids in firming and tightening skin, leaving a fresh feeling behind. Our beauty experts suggest a mask 2-3 times a week, adjusting for personal preference over time. If you wish to improve the tightness and firmness for the area around your neck and chin, consider Cougar Beauty Sculpt Perfect Neck and Chin Lifting Serum. This specially formulated serum is designed to help tighten the skin around your neck and chin area. Application frequency is flexible with this product. It’s really up to your individual needs. Those desiring the best results can apply this during their normal morning and evening routine, after your moisturizer. Apply as infrequently as 2-3 times per week. It’s really up to you and your individual needs! Tired-looking eyes set back your entire appearance. A specially formulated product that targets this problem area is your instant solution to this troubling problem! Cougar Beauty Lifting Eye Serum is your immediate answer and on-the-go solution. This amazing serum helps minimize the appearance of fine lines and wrinkles, hydrates skin, all with quick results! Application of a couple of drops per eye is all that’s required. Massage the serum around your eye area and see for yourself. We’ve only provided the essential foundation to your Cougar Beauty routine. You’re encouraged to explore our full range of Cougar Beauty products. Substitute any similar product for our suggestions, based on your personal needs and preferences. That’s the beauty of this versatile product range. Cougar Beauty has you covered, no matter your skin type! Discover what’s waiting for you with Cougar Beauty!